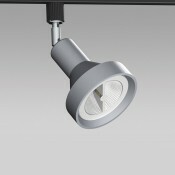 A track or ceiling mounted luminaire with specific led light 230V source. It highlights impressively premises, such as shopping malls, stores, hotels, exhibition halls, museums etc. It is compact and economical architectural version.